It had been hoped the bridge would open in early May 2000, at the same time as the opening of Tate Modern, but work fell behind schedule. However, on 9 May the Queen, accompanied by the Lord Mayor of the City of London and the Mayor of Southwark, walked on to the still incomplete bridge to dedicate it. On 8 June the lighting of the bridge was celebrated with a spectacular firework dispay and on Saturday 10 June it was officially opened to the public. The embarrassing events of that day were reported around the world and have given the bridge a name it will retain forever. A sponsored charity walk had been organised to mark the opening, and soon after the walkers started to cross the bridge it began to sway slightly. When members of the public were allowed on at lunchtime, the numbers were far greater than expected, and the “wobble” was much more pronounced, especially on the central and southern spans. The movement was so great that people had to hold on to the handrail to stay upright, and it was feared someone might fall over and be injured. The bridge was closed for engineers to make checks; when they pronounced the bridge safe, it was reopened, but with a limit on the numbers allowed on it. Over the next couple of days the wobble was monitored and the bridge was closed on 12 June so that the engineers could find out what had gone wrong and look for a solution. A view of the almost permanently crowded Millennium Bridge from Tate Modern. The engineers found that the problem was caused by the number of people using the bridge, not by any structural fault. All suspension bridge move, but, when a certain number of people walk on a bridge, the natural damping in the structure no longer woks. In this case, when pedestrians felt the sideways movement they adjusted their steps to the bridge's motion, making the movement even greater, eventually resulting in the violent wobble experienced. The solution was the installation of dampers, but this had to be done without affecting the appearance of the bridge. After tests were carried out, around ninety dampers, which act like a car's shock absorbers, were installed during 2001. Most of them were placed underneath the deck, were they are almost invisible. The most visible dampers are the diagonal ones on either side of the pier arms, but these were so well designed that they appear to be part of the bridge's original design. 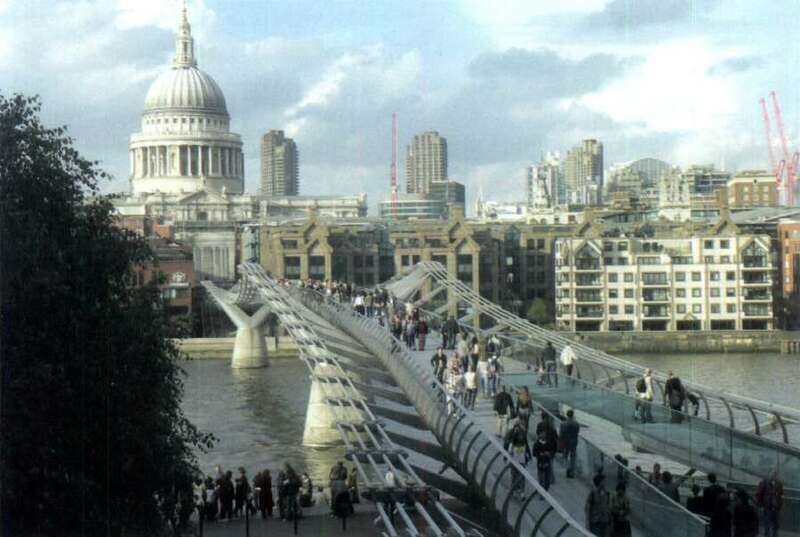 At the end of January 2002 the Mayor of Southwark led two thousand volunteers over the bridge to test the repairs. The results were very positive, so the bridge finally reopened on 22 February. Although the bridge no longer wobbles, it will forever be known as “wobbly bridge”. Today it is busy at all times of the day, and tourists and Londoners alike use it, enjoying the views up and down the Thames without the noise and vibration of traffic or trains experienced on other bridges. The whole project cost 23 million pounds, 5 million of which was spent on installing the damping, and this was 7 million pounds over budget. Over 7 million pounds of the funds came from the Millennium Commission, a similar amount was contributed by the Bridge House Estates, and HSBC was the biggest corporate sponsor. The bridge is now maintained by the Bridge House Estates.